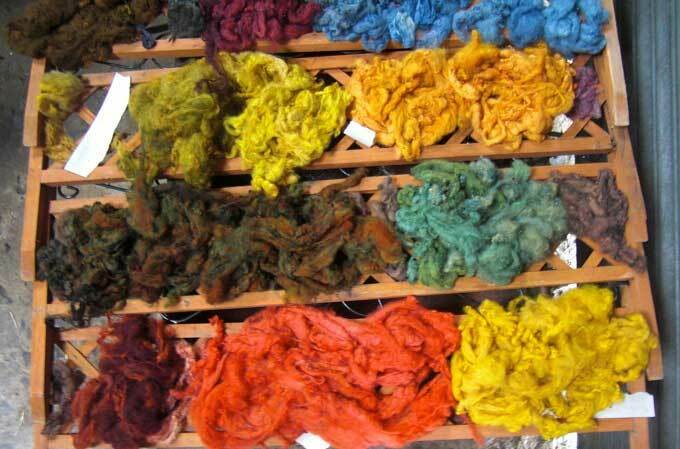 Natural dyeing is an exciting process, which is done best with a group of people. 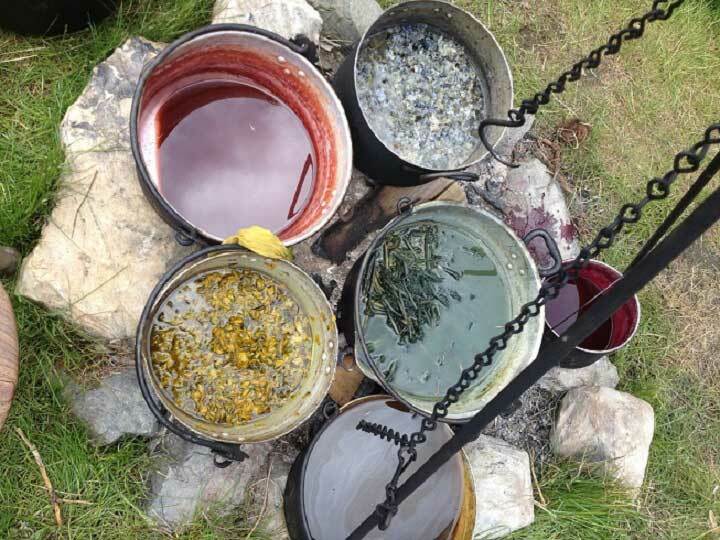 It is great fun working together, picking, processing, making dyes, lighting fires and lifting pots! All this hard work is well worth it as the results can be really beautiful. I like to do my dyeing over an outdoor fire the traditional way. There is nothing quite like spending a weekend outdoors using ancient techniques to produce something really special. 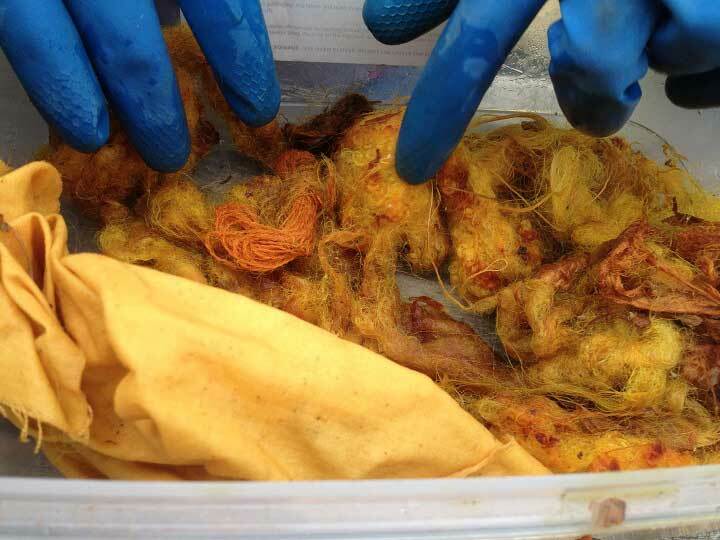 Natural dyeing has always played an important part in Scottish history, with tartans and tweeds all originally being produced with natural dyes. There are many dye plants growing in the Highlands, you can see them practically everywhere you look in the spring and summer. However, some of these plants are not as abundant as they once were, so for these we use other plants as substitutes. Lichen, for example, was once widely used in cloth dyeing in the Highlands of Scotland. Most Lichens (particularly rock Lichens) are very slow growing, so we only use a small amount of tree lichen as a sample dye, to show its properties as a dye plant. Most colours can be produced from a number of different plants, so it is easier than you would imagine to make a spectrum of colours from the plants around you. Some colours are harder to make using native plants, such as strong blues and reds. Indigo and Madder were imported to Scotland as far back as the 13th century to produce these colours. Different parts of a plant can produce different shades and even different colours. Sometimes a whole plant is used, other times just the flower or the leaves are employed and often the roots can produce a very strong colour (although we make sure we do not pick or dig up the roots of any protected plant.). Over the weekend we will make and use a mixture of native and imported plant dyes to produce a rainbow of coloured wool. 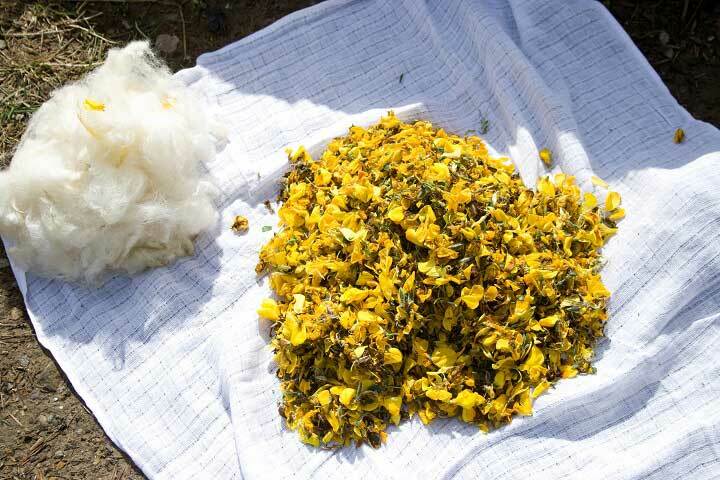 Some of the plants we may use include; Nettles, Bog Myrtle, Birch bark, Heather tops, Indigo, Madder, Turmeric, onion skins, Marigold and Elderberries (depending upon the season and availability). We will use different mordents to fix the dye to the wool and to create different shades, including; aluminium sulphate, rhubarb leaves & iron. 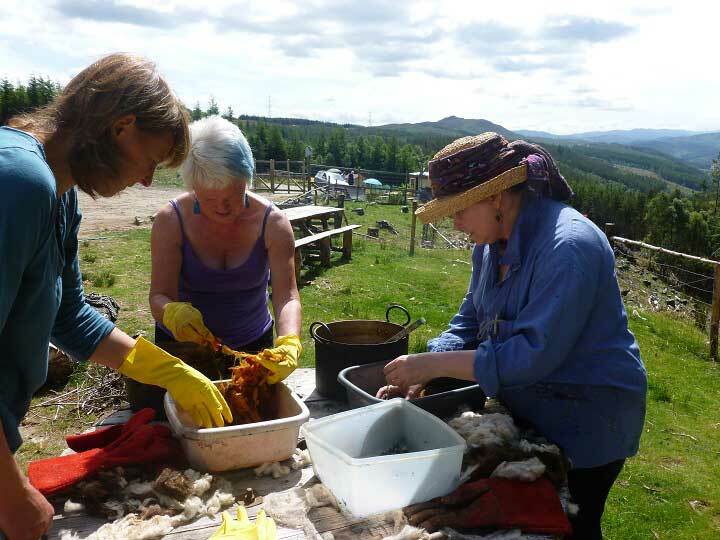 The aim of the weekend is to give you a good basic knowledge of natural dyeing and to give you the skills and confidence to continue dyeing when you get home. Courses are run from Saturday 10am to Sunday 4pm and the price includes all materials, lunch on Saturday and lunch on Sunday. You can choose to stay in a local B&B, hostel, static caravan, campsite or glamp in our yurt in the woods. Our personal recommendations for these can be found on our Accommodation page. Days, £75 per person and includes lunch, running from 10am-4pm.